I've been using LaTeX for about two years; I'm only learning TeX now, to get a better understanding of the foundations. 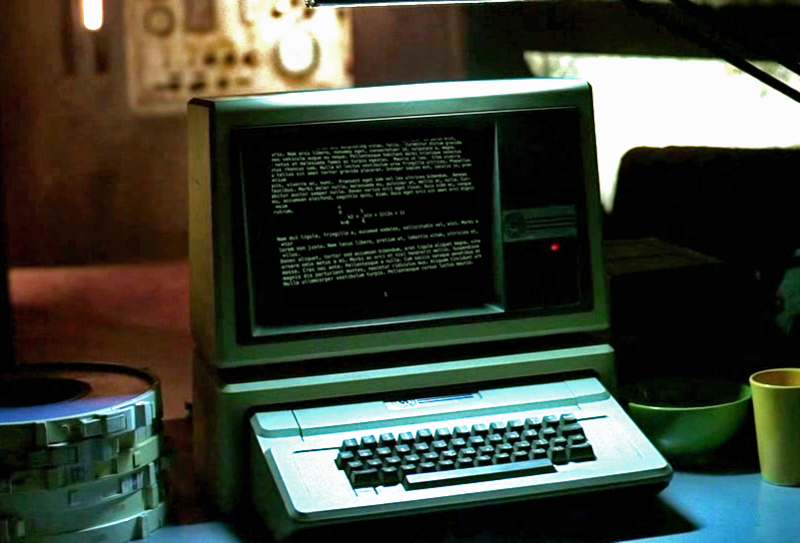 Go to the lab where the graphic output device is, since you will be wanting to see the output of what you get---it won't really be satisfactory to run TeX from a remote location, where you can't hold the generated documents in your own hands. This passage left me a bit confused: back in the day, when TeX was released, did one have to print out the output document (i.e. produce a hard copy) in order to visualise it? If not, what was on-screen visualisation like? Was the quality sufficient to get a good idea of what a hard copy would look like? I'm just being curious, here... If on-screen visualisation was indeed possible, would anybody have screenshots they'd be willing to share or link to in an answer? EDIT: Since all of the answers I've got so far are equally valid, I cannot reasonably accept a particular one. It depended on the available hardware. My first tries with TeX were on a VT-100 terminal and the only "previewer" was dvi2tty. Actually the screen background was grey and the text was green, but this gives an idea. (I was just too lazy to prepare a Plain TeX source file.) Oh, and the printer connected to the mainframe (a Vax/VMS system) was in another building a couple of kilometers away. 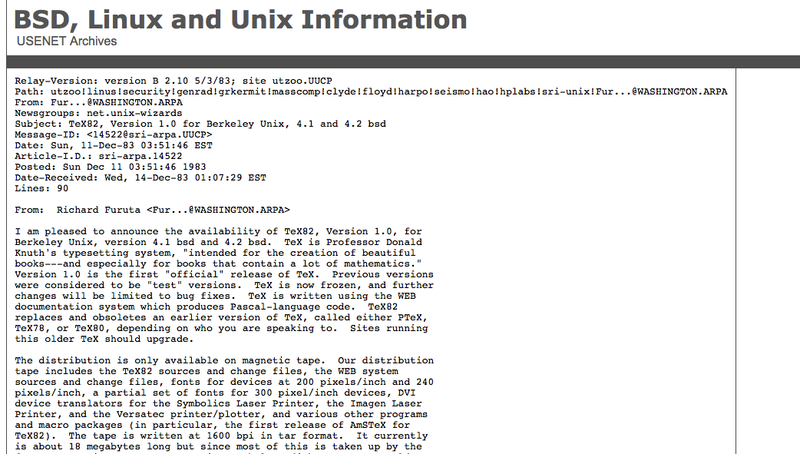 I started using TeX in 1987 on SunBSD (later sunos later solaris) using the dviview previewer from the vortex project. That is still one of the best viewers around, you could select individual characters ask what font they were in, and the rendering was as good as the (monochrome) screen could handle. OK. I was officially the first TeX user in Imperial College, London, using it to write my PhD thesis. Malcolm Clark was the one person in Computer Centre who supported TeX. Screen? Previews? They didn't exist at the beginning. it has been asked how knuth viewed his "first page". it was definitely not on screen. it was most likely printed out on the xerox xgp which was installed at the stanford ai (artificial intelligence) lab (sail). in the book "companion to the papers of donald knuth", don says (pp.58-59) that he'd been "playing around" with this machine for a few years. it doesn't say definitively that the "first page" came out of the xgp, but no screen output is mentioned at that stage for display of more than one or two letters at a time, and that's a terrible way to try to decide that a whole page is "perfect". you can learn a whole lot more about don and printing (and about everything else that he's done) from that book. it contains an extensive index to all his books and a complete bibliography including all his papers that were in print up to 2011. recommended. At Stanford, there were a couple of electrostatic printers, 200dpi, made by Versatech and Benson-Varian; output was on rolls of slightly slimy paper since it had to go through a smelly liquid bath. Stanford also had a xerox xgp printer (approximately the size of a refrigerator, or a computer mainframe unit, if you remember those) with about the same resolution that used dry toner, but it was coarser then the toners now used, and periodically it would clump into little grains that were large enough to punch tiny holes in the (plain) paper. Output on these was often magnified to 130% and photographically reduced to smooth out the edges. 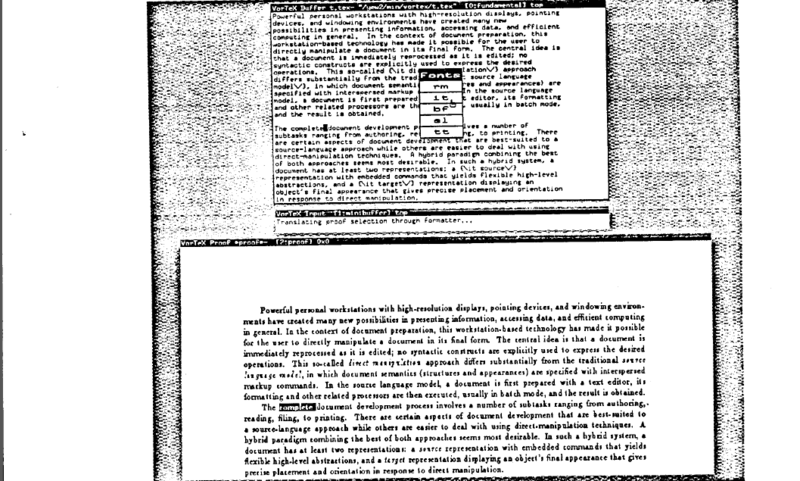 The first really hi-res output was to an alphatype crs, with a nominal resolution of 5333 dpi. (This was generated on a crt screen at much lower resolution and larger size, and stepped down through lenses.) The photographic paper onto which it was imaged was on large sheets, each of which could -- just barely -- accommodate four letter-size pages, the size of tugboat pages in fact. Early issues of tugboat -- look for the entries for "outout devices" -- have lots of examples and technical info. The earliest mention in tugboat of a previewer seems to be in 1982, at Stanford, for the data-disc displays on a decsystem-10. a previewer running under vax/vms was mentioned in the first 1986 issue. The last 1986 issue announced previewing on an early macintosh, complete with a screenshot -- just look at those jaggy edges! At a beginning I was using TeX on PC XT without HDD and with the Hercules graphics. The difference between on-screen visualization (not more than 70 dpi, inversion of colours) and the print on the printer giving near 240 dpi was very visible. Alas, the printing time was not in pages per minute but rather in minutes per page. An extreme case: about 30 min/page. It sounds like a joke, but it isn't. I bought an Atari ST in 1985 which had a 640x400 monochrome screen. 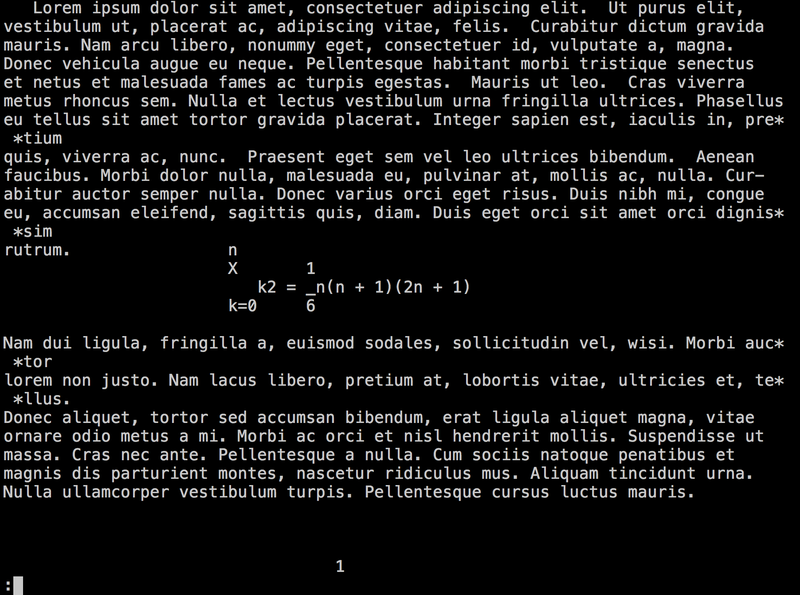 Based on the purchase date of Lamport's LaTeX book I started using TeX on it that year. The onscreen preview was OK, but needed scrolling and zooming for checking things in detail because of the Atari ST screen resolution. That however was way better than printing things out on my 9-pin Star SG-10 printer and reviewing that. The printer would go over each line 3 times before advancing and need more than one such pass for a line of text. Resulting in minutes/page out (around 10 IIRC) instead of pages/minute. For a friend's thesis I let that run overnight and went to sleep somewhere else. 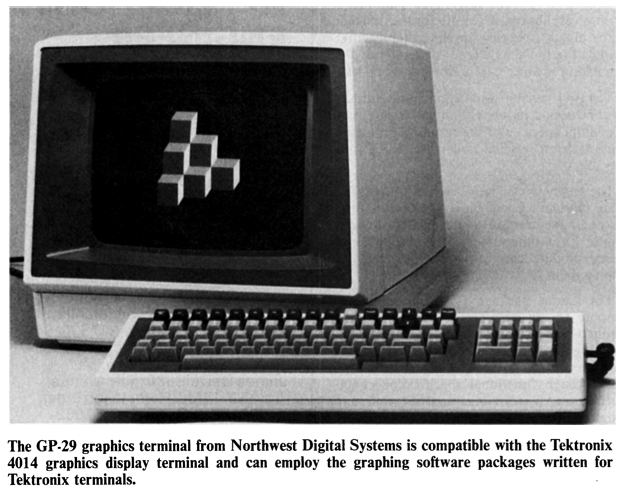 I used a GP 29 terminal that would preview TeX. That was in 1987. Note that the very first version of TeX - TeX78 - was written to allow for better typesetting of Knuths books - especially the math heavy bits - not as such for general consumption. The rewrite into TeX82 (along with MetaFont) was as literate programs (where you write an essay on your program containing snippets of actual code which was then assembled into the final program - this was due to the strictness of the pascal compiler). The original programs used by Knuth is unknown to me but most likely something like rendering DVI files to something which could be manually inspected - and also the typesetter needed to generate proofs for proofreading. At the time I learned about TeX (late 80'es) we used xdvi to inspect output on screen (without figures and a lot of zoom to overcome the low display resolution, it was a bliss when we found out about anti-aliasing on 256-color devices) and dvips to generate final PostScript. dvi2tty could be used if you only had access to a character based terminal. As a side note I would like to mention that a long while back I read an article where Knuth said something along the lines of that if Postscript had been available to him at the time he probably would have used that instead of DVI (or perhaps MetaFont). Unfortunately I cannot locate said article again, so my memory may be wrong. Note that this did not need to be a complete typeset document for printing, but perhaps just font descriptions (for rendering into DVI) or similar. Not the answer you're looking for? Browse other questions tagged viewers printing tex-history or ask your own question. Does DVI file appear same on different DVI viewers? Are there any document viewers that use Tex as a backend?